The Krugerrand is the official gold bullion coin of South Africa. It was first minted in 1967 by the South African Mint to help market gold from South Africa. Moreover, it was the world’s 1 oz gold bullion coin that was issued by a government to be legal tender. Since September 1980, the coin has also become available in three different sizes containing exactly 1/2 ounce, 1/4 ounce and 1/10 ounce of pure gold. The Krugerrand is guaranteed as to weight and gold content by the South African government. 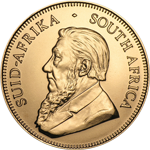 The name of the gold coin is a combination of “Kruger,” after State President Paul Kruger of the South African Republic, and “rand,” after the South African unit of currency. The obverse side of the coin features a profiled bust of President Kruger, as well as the name of the country in its two official languages, English (“SOUTH AFRICA”) and Afrikaans (“SUID AFRIKA”). The reverse design shows a springbok antelope, one of the national symbols of South Africa, which was originally used on the South African 5-shilling piece. The reverse side also features the year of minting and the coin’s fineness. In 2018, the South African Mint and Rand Refinery used this same coin design to manufacture the silver Krugerrand coin. Each gold krugerrand coin is minted from gold alloy that is 91.67% pure (22 karats). The Krugerrand does not have a face value. Its legal tender value is the bullion value of gold at its current market price. It was the first bullion coin whose legal tender value was determined only by the bullion value of its metal content. The coin was initially introduced as an opportunity for private investors who wished to own gold. As the Krugerrand was legal tender in South Africa, the gold coin could be used for portfolio diversification in the United States, where private ownership of gold bullion was prohibited, but ownership of foreign coins was permitted. Even though the Krugerrand accounted for 90% of the global gold coin market by 1980, many Western countries banned the coin during the 1970s and 1980s due to the economic sanctions against South Africa for its apartheid policies. This ban was lifted in 1994 when South Africa ended the apartheid regime. The South African gold Krugerrand is one of the most popular coins among collectors. They are durable, easy to transport and store, and easily tradable because they are so well recognized. The South African Mint also produces a limited number of proof Krugerrand coins intended as collector’s items. They can be distinguished from the bullion Krugerrand coins by the number of serrations on the edge of the coin. Proof coins have 220 while bullion coins have 160.